Pillar Rock canned salmon bearing the OU symbol is acceptable for Pesach use. From the cRc: Tom's of Maine Wholecare Spearmint and Wholecare Peppermint toothpastes bearing the OU are acceptable for Pesach use. From the COR Detroit: TOOTHPASTE: Aim, Close, Up, Colgate, Pepsodent, Ultrabrite. Kirkland brand Almond Flour bearing the KORC is acceptable for Pesach use. 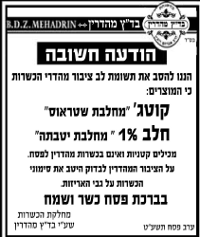 "Badatz Mehadrin, the hashgacha of Rabbi Avraham Rubin, announces one who does not eat kitnios on Pesach should be alerted to the fact that 1% cottage cheese from the Strauss Company contains kitnios and is therefore, not mehadrin for Pesach as it is during the year." "n general, shoppers in Israel are urged to be extremely vigilant, even when shopping in the chareidi supermarkets before Yomtov as too often, there are non-Pesach items mixed in with the Pesach items. This has been found to be the case this year in the supermarkets frequented by chareidim." "In addition, as is the case with the cottage cheese above, some products on Pesach shift from being mehadrin year-round to non-mehadrin regular kosher on Pesach. The Passover certified almond butter that was recalled is Wholesome Pantry Organic Creamy Salted Almond Butter with OU-P, Date code WA9024.